PODERE VIGLIANO is a privately-owned historic farmhouse situated in Umbria, Italy. It’s rented out as a vacation rental by its owner. Surrounded by the Umbrian countryside the 275-year-old farmhouse has 4 bedrooms, a private pool, large garden, and fully equipped kitchen to comfortably house up to 8 persons. 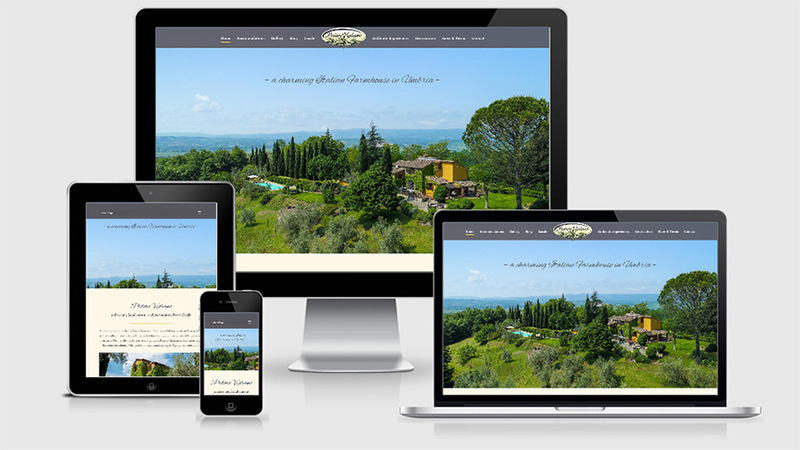 PODERE VIGLIANO had operated a website for several years. The existing website was built in HTML and hadn’t been updated for some time. The pages were not responsive or optimized for tablet or smartphone. The goal was to design a website that would function as a powerful marketing and communications tools to attract new customers and increase business. The brand colors yellow/burnt orange and green were maintained in the new design. The client expressed the desire for an updated, modern look but still reflecting the colors of the countryside and the style of a country stone farmhouse. With a romantic and wistful style. The project consisted of a total redesign of the website in WordPress with an improved content strategy and site navigation. The new fullwidth website has a clean and modern layout, is easy to navigate and fully responsive to optimize user experience. We opted for a booking software with an availability calendar. Photos and video play an important role on the website to showcase the various features of the farmhouse and its surroundings. Greater prominence was also given to the facilities, guest testimonials, and authentic experiences.